The president of the United States must carry out his or her tasks and responsibilities, as President Franklin Roosevelt has stated, “. . . realizing that he is President of all the people.” In the first U.S. census of 1790, taken three years after the Constitution was ratified, the population of the United States, including slaves, was 3,929,326. Today, the 2016 population estimate exceeds 324,118,787, and the president must represent and work for all of us. From our comprehensive Presidential Fact Files to stories of George Washington’s massive hound dogs to humorous tales of presidential embarrassments, here you will find information to encourage young people to read and learn more about all of our presidents. 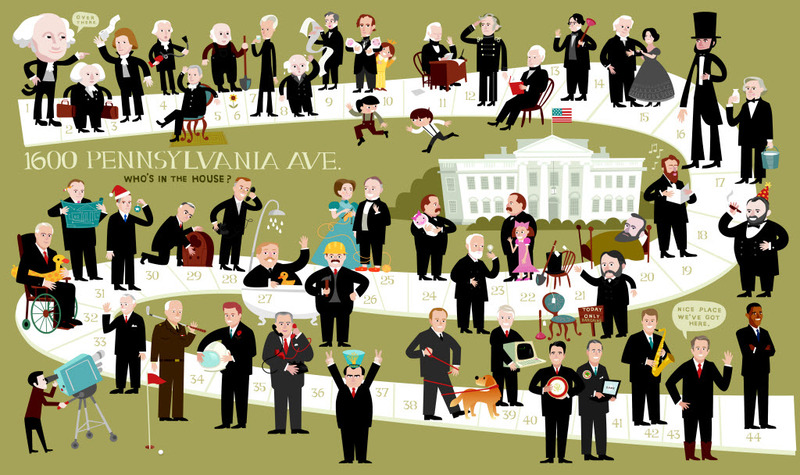 Share this extensive database of the presidents with young people, which includes dates, family information, achievements, historical connections, quotes, and resources for digging deeper. What does it take to be president? Discover the qualifications, consider the benefits, and don’t forget the risks. Ironically, the father of our country had no children of his own, but he was involved in breeding of another nature—that of mules and hounds. The president of the United States holds the highest position in America, but presidents are people too. Discover what you might have in common. A Profile of Vermonter President Calvin Coolidge, the 30th President of the United States, written by Katherine Paterson. Nine vice presidents have ascended to the presidency following a president’s death or resignation. Find out how presidential succession and the vice president’s influence have unfolded since Vice President John Tyler set the precedent for orderly presidential succession. If you have an original hardcover edition of Our White House: Looking In, Looking Out, you can download and print on sticker paper a President Barack Obama sticker for young people to finish the presidential timeline as illustrated by Bob Kolar through the 44th administration.